Lee & Low Books, 9781600604515, 160pp. 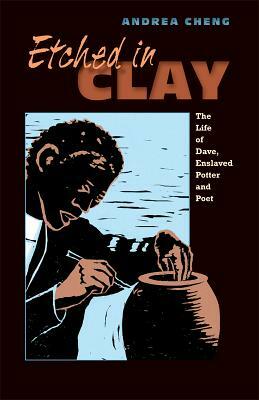 Sometime around 1815, an enslaved young man named Dave was brought to Edgefield, South Carolina, the center of a pottery-producing area known for the alkaline glazes used on the stoneware. Dave was taught how to turn pots and jars on a pottery wheel by one of his first owners. As Dave's talent flourished, he created pieces of great beauty and often massive size. He also somehow learned to read and write, in spite of South Carolina's strongly-held fear of slave literacy. And then Dave did something even more incredible--he began to sign his jars and carve many of them with sayings and poems that reflected his daily life and experiences. He spoke out against slavery not by protesting or revolting, but by daring to write at all. Andrea Cheng has crafted a biography in verse as beautiful as one of Dave's jars. In simple, powerful words, including some of Dave's original writings, we learn his extraordinary story of courage, creative inspiration, and triumph.